New Year Update – Icons and More! It’s time for another product update and we want to thank you once again for all the feedback you have emailed and added to our forum. We really appreciate it! Please feel free to comment below to let us know what you think of these updates! We have added over 200 icon stencils to Pidoco – ranging from social media icons to currency symbols. These are organized by category in the stencil palate, so just click on “expand” to see the full range in each category. Once you have added your icons to your page, you can change the size in the context menu. There are five sizes to choose from. We have expanded our shape stencils to include the triangle stencil to help you get creative in your prototypes. The new icons can also be found in the Mobile Edition as well as the Autocompleter, Accordion, Rating, and Toggle Section Stencils. 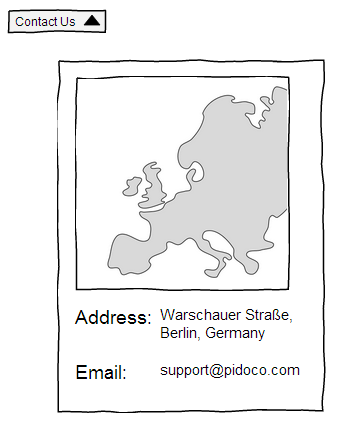 You can try out our Mobile Editor with the Pidoco Free Trial. We’ve updated the Toggle Section so that you can choose the overlay offset when the stencil is clicked in simulation (i.e. where the overlay should open on the page). You can also specify how large you would like the overlay width to be, so you can avoid scroll bars from showing up. You can set a target as an external webpage, or another page in your prototype. In the example on the left, I have created an overlay with contact information. The overlay opens 50 pixels below and to the right of the “Contact Us” trigger in simulation. Here it is shown in sketched mode. We hope you enjoy these updates and stay tuned for our future releases. Don’t forget to follow us on Twitter and like our Facebook Page. Thanks for all your great feedback and Happy New Year! Take a look at balsamiq and stay inspired! Add stencils for responsive web design. Think about svg import. Keep up the great work.